Saand Ki Aankh first look: The makers of Saand Ki Aankh has recently released the first look of the film featuring Taapsee Pannu and Bhumi Pednekar along with the release date of the film. The film is directed by debutante Tushar Hiranandani, who is best known for writing films like ABCD 2 and Half Girlfriend. 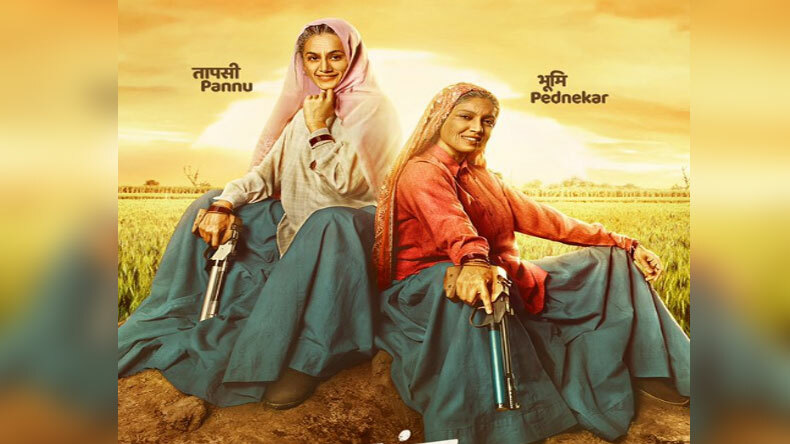 Saand Ki Aankh first look: Finally, the first poster of Taapsee Pannu and Bhumi Pednekar’s film Saandh Ki Aankh is out and is creating a lot of buzz on social media. Yesterday, it was announced that the poster will be out today and early this morning, the first looks of the stylish actors as women sharpshooters released along with the release date. It seems that the lead actors Bhumi Pednekar and Taapsee Pannu have emerged well in their characters of Chandro and Prakashi, world’s oldest women sharpshooters. Talking about the characters, the talented two ladies are from Johri village from Uttar Pradesh. Dressed in shirts and ghagra, the two are suiting their characters well. Further, the slogans on the posters read Tann budha hota hai, mann budha nai hota. Talking about the film, it is a biographical drama film based on Chandro and Prakashi Tomar, oldest shooters of the world, under the banners of Anurag Kashyap production. Talking about social media reactions, fans are waiting for the film eagerly. Not only this, they are also praising the lead actors Taapsee Pannu and Bhumi Pednekar in their new look. People are also demanding the film to release a little early. In an interview, Taapsee also revealed that this film is one of the most difficult projects for her as to get into the characters was a way to difficult. Currently, the actor is quite excited about the film. 2 Jatni Diwali pe Patakhe nhi Goliyan Chalayegi.. Fantastic !!!! Eagerly await the release .. The film was initially titled as Womaniya but due to some arising controversy due to rights on the title of the film by Pritish Nandy, he demanded Rs 1 crore for his title from the film’s team. Then the makers decided to rename the title of the film. Apart from Taapsee Pannu and Bhumi Pednekar, the film also features director Prakash Jha in a pivotal role. Talking about the actor’s future projects, Taapsee Pannu would next appear on the screen in Mission Mangal with Vidya Balan, Sonakshi Sinha and Akshay Kumar. Meanwhile, Bhumi has a list of films in her kitty like Dolly Kitty Aur Woh Chamakte Sitare, Takht and Pati Patni Aur Woh with Kartik Aaryan.